MADRID — A Spanish judge jailed nine former members of Catalonia's separatist government Thursday and was deliberating a possible international arrest warrant for the region's ousted president, who remained in Belgium while the others appeared in a Madrid court for questioning about their efforts to break away from Spain. Former President Carles Puigdemont and his 13-member Cabinet are being investigated for rebellion, sedition and embezzlement stemming from their pursuit of Catalan independence. The Spanish government removed them from office on Oct. 27 and they were summoned to appear in Spain's National Court on Thursday. After the nine Catalan Cabinet members who showed up were questioned, a judge sent eight of them to jail without bail. One was ordered held in lieu of 50,000 euros ($58,300) in bail. The seven men and two women were taken from the court in police vans hours later and assigned to prisons in the Madrid area. 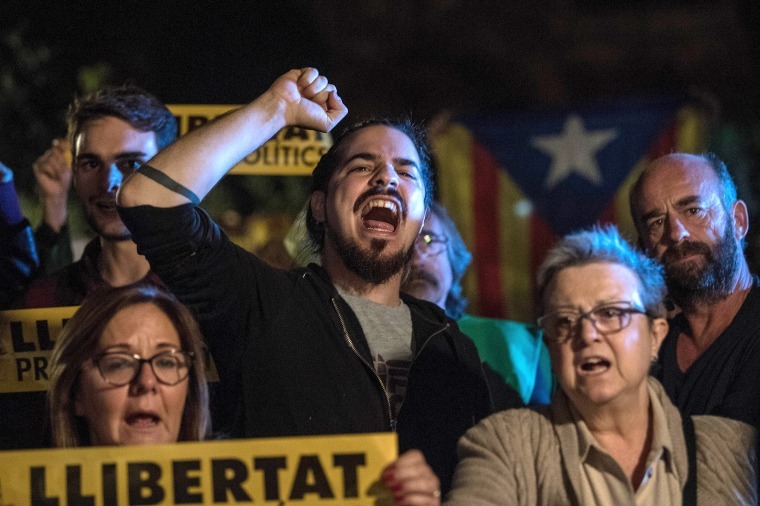 Thousands of protesters took to the streets of Catalan towns to condemn the pre-charge detentions, which fellow separatist politicians and elected officials criticized as an attack on ideas. "We won't give up, we won't fail, we will fight till the end," Marta Rovira, an increasingly prominent politician in Catalonia's republican-left ERC party, said. "We have all the right in the world to live in a country with more justice, dignity and freedom," she told reporters as tear welled in her eyes. The Spanish government said it does not comment on judges' decisions in deference to the separation of powers. Investigative magistrate Carmen Lamela ordered the officials into custody at the request of prosecutors, who also asked Thursday for an international warrant seeking Puigdemont's arrest. Under Spain's legal system, investigating judges can have suspects detained while a comprehensive probe, sometimes taking months, determines if they should be charged. Puigdemont surfaced in Belgium on Tuesday with some of his ex-ministers, saying they were seeking "freedom and safety" there. He and four of the officials remained in Brussels on Thursday. Asked whether Puigdemont would turn himself in if the arrest warrant is granted, his lawyer in Belgium, Paul Bekaert, told The Associated Press: "Certainly. Or the police will come get him." Bekaert said Puigdemont intends to cooperate with Belgian police. Also Thursday, six Catalan lawmakers appeared for a parallel session in the Spanish Supreme Court. They were given a week to prepare their defenses and instructed to return for questioning on Nov. 9. In all, Spanish prosecutors are investigating 20 regional politicians for rebellion and other crimes that would be punishable by up to 30 years in prison. In a written ruling, the National Court judge said the eight jailed without bail had planned and executed a roadmap since 2015 to create an independent Catalan republic. The ruling said the activities of those under investigation were "meditated and perfectly prepared and organized, repeatedly disobeying systematically over two years Constitutional Court resolutions in favor of the independence." The judge said the eight were being jailed without the possibility of bail because of the risk of them fleeing prosecution or hiding or destroying evidence. Lawyers for the jailed officials said they planned to appeal Lamela's order. Jaume Alonso-Cuevillas, who represents Puigdemont and four more of the ousted Cabinet members, said the judge's decision to send them to jail "lacked justification" and was "disproportionate." The Catalan officials' supporters and party aides in Madrid were seen crying outside the courthouse when the judge's decision was announced. They shouted "Freedom! Freedom!" and sang the Catalan official anthem, "Els Segadors," which translates to "The Reapers" in English. Spain took the unprecedented step of triggering constitutional powers allowing it to take over running Catalonia following a declaration of independence by the regional parliament on Oct. 27. Madrid dismissed the Catalan Cabinet, dissolved the parliament and called a new regional election for Dec. 21. Junqueras, in a tweet sent shortly after the judge's decision, called on Catalans to cast ballots to defeat unionists. "Do every day everything that is in your hands in order for good to defeat evil in the ballots of Dec. 21," the tweet posted through Junqueras' account said. "Standing up, with determination and onward to victory." Puigdemont, also in a tweet, wrote that "the legitimate government of Catalonia has been jailed for its ideas." Javier Melero, a lawyer representing some of the separatist lawmakers investigated in the Supreme Court, criticized Puigdemont and the four ministers who skipped court. He said their actions would be damaging for his clients, three lawmakers who are members of Puigdemont's PDeCAT party. "Not being at the service of the judiciary when you are summoned is always damaging for the rest of those being investigated," Melero said. About two dozen politicians and elected officials from Catalan separatist parties gathered at the gates of the Supreme Court in a show of support for the lawmakers under investigation. "If the question is if in Spain you can trust the judicial system, my answer is no," said Artur Mas, a former president of the Catalan government. "From the personal point of view and also for my personal experience, I don't think that there are all the guarantees to have a fair trial." Mas was banned by a Barcelona court from holding public office for two years after he ignored a Constitutional Court ruling and went ahead with a mock vote on Catalonia's independence in 2014. Across the street, half a dozen protesters with Spanish flags were stopped by police. They shouted at the Catalan politicians, "cowards" and "to jail, to jail." The protracted political crisis over Catalonia, Spain's worst in decades, could have an impact on the country's economic growth, Spain's central bank warned in a report published Thursday.